This beautiful 16-page full-color magazine for parents of new students to Grace College is being given to parents of new students at Welcome Weekend. It is a joint project between the Student Development Department and the Publications Office. 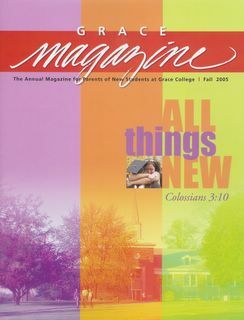 Edited by Judy Daniels (BA 72) and designed by Terry Julien (BA 80), the magazine helps to orient parents to campus and also gives them encouragement as they adjust to having a student in college. Grace has produced a parents’ magazine every fall since 2000. It’s also used throughout the year by college recruitment staff, especially when parents and students come for campus tours. Articles include “Parenting by Prayer” by Grace President Ron Manahan and “The Academic Challenge” by VP for Academic Affairs David Plaster, along with the year’s academic calendar and a campus map. “Basics to Know” includes information on campus health services, counseling services, campus safety, banking, and more.